In the wake of the right-wing coup in Ukraine organized by the United States and the European powers, the American media is responding with a torrent of inflammatory war propaganda directed against Russia. In the newspapers and on the airwaves, the demonization of Russia is unrelenting. The coverage of events follows a single simplistic story line. The actions of Russia are portrayed as the epitome of evil. Its president, Vladimir Putin, is the devil incarnate. The historical background, the economic interests, the political context and the geo-strategic calculations that underlie Russia’s actions are ignored. No facts are allowed to get in the way of the programmed message. No lie is too absurd or ridiculous. 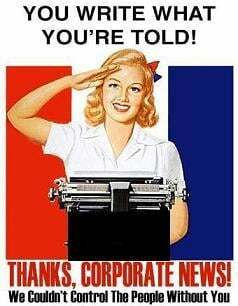 The purpose of the propaganda campaign is not to convince public opinion, but to intimidate it. Monday’s lead editorial (“Russia’s Aggression”) in the New York Times does not contain a trace of analysis. It consists entirely of denunciations, saber-rattling and limitless hypocrisy. The Times begins by denouncing “Putin’s cynical and outrageous exploitation of the Ukrainian crisis to seize control of Crimea.” Reality is stood on its head. The United States supported right-wing and fascistic forces in Ukraine to bring about regime-change in a country on Russia’s border. These operations were exposed to the world in a telephone conversation leaked last month in which the US ambassador to Ukraine and the US assistant secretary of state discussed the composition of a new Washington-backed government. Of course, the Times makes no reference to this episode. Who is outside the bounds of “civilized behavior?” The United States has intervened in country after country—from Panama, Grenada and Vietnam to Afghanistan, Iraq, Libya and Syria. Its military operations over the past quarter-century have resulted in the deaths of at least a million people. The Times also published a column (“Putin’s Crimean Crime”) by Roger Cohen, who postures as an intellectual and foreign policy specialist. He has over the years championed every manner of US military aggression, from the Balkans to Syria. He counted as a close personal friend the late US Ambassador to Libya Christopher Stevens, who was killed at the US consulate in Benghazi after helping organize the operation to overthrow the government of Muammar Gaddafi. Putin’s actions are portrayed as incomprehensible. Why should he feel threatened by “NATO’s expansion into the Baltic states;” “the European Union’s embrace of the likes of Poland and Romania;” “the humbling by NATO of Serbia;” or “the West’s perceived manipulation of a United Nations mandate to have its way in Libya?” Clearly, Putin is mad! In a brief and repugnant foray into history, Cohen refers in passing to the crimes of the Nazis in Ukraine during World War II, but does so in a manner that suggests they were only a continuation of Stalin’s crimes. “The Nazis later [after Stalin] did their worst,” he writes blithely, stating that “more millions died.” Here Cohen joins a growing list of right-wing historians who are relativizing Nazi crimes as part of an effort to justify German remilitarization today. Cohen then refers without explanation to the “corpse-filled ravine of Babi Yar.” Readers unfamiliar with history might assume that Cohen is referring to a Stalinist atrocity. He does not inform his readers that the Babi Yar ravine in the Ukrainian capital of Kiev was the site of the horrific massacre of 33,000 Jews by the Nazis on September 29–30, 1941. This event occurred just three months after the start of the Nazi “war of extermination” [Vernichtungskrieg] against the Soviet Union. The operations of German imperialism included the murder of six million European Jews. Approximately 27 million Soviet soldiers and civilians died in the struggle to defeat the onslaught of Germany’s fascist regime. Significantly, Cohen refers to Babi Yar without mentioning the political pedigree of the forces in Ukraine with which the United States and Germany are currently working. The opposition is dominated by virulent anti-Semites. The Svoboda party is the major political force in the protests that overthrew Yanukovych. It was formed in 2004 as part of a rebranding effort by its predecessor organization, the Social National Party of Ukraine (SNPU). This party, whose members wore insignias that had been used by the Waffen SS, was compelled to change its name because its close association with fascism complicated the US effort to integrate it into the “Orange Revolution,” which was finally carried out in 2005. Oleh Tyahnybok is the long-time leader of Svoboda and participated in the meetings with US and EU officials that prepared last month’s regime-change. In 2004, Tyahnybok gave a speech on Mount Yavoryna in which he lauded the Ukrainian Insurgent Army of the World War II era. The UIA (Ukrainian Insurgent Army) “fought against the Russkies, fought against the Germans, fought against the Yids [Jews] and other filth that wanted to take from us our Ukrainian state,” he said. Tyahnybok praised his listeners as the force most feared by “the Russkie-Yid mafia that controls Ukraine.” In 2005, Tyahnybok signed a petition demanding the banning of Jewish organizations in Ukraine. Roger Cohen studiously avoids any reference to the fascistic and anti-Semitic forces with whom the US is allied in the Ukraine. In this, however, Cohen is not alone. The subject is all but taboo in the US press. The coordinated character of the US media response makes clear that one is not dealing with the writings of individuals, but rather the unfolding of a quite deliberate plan aimed at indoctrinating the public to accept actions previously considered unthinkable. Such a war would have catastrophic consequences. The fight against war requires an unrelenting struggle to expose the lies of the media. We urge our readers to build up the following of the World Socialist Web Site among workers and youth. Share and distribute our articles. The people of the world must be alerted to the grave danger that exists.